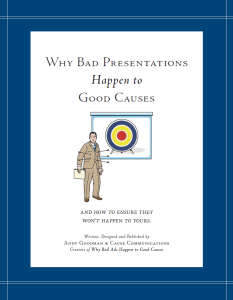 Our boardroom has seen quite a few “bad presentations happen to good causes” which is why I was very excited to stumble upon the e-book ‘Why bad presentations happen to good causes’ by Andy Goodman the other day. Thinking back to the tragic moments when we saw those presentations needlessly crash and burn (one endless PowerPoint slide at a time), I think it is important to make our grantees and other NGOs aware of this resource. This is probably the only resource on doing presentations that you will ever need, it is extremely detailed and while I am not too excited myself to be reading through a 100 pages of ‘how to do a good presentation’, I do believe that it can dramatically change the outcomes of NGO presentations if they go to such trouble. And for those of you that think presentations does not matter that much, as an eyewitness of the effects of presentations on funding related outcomes, I assure you the ability to effectively showcase your work through a presentation is definitely an essential skill. From here the book takes us systematically through the process of preparing or building a good presentation, improving our delivery, using PowerPoint effectively and lastly the logistics around a presentation. The book includes a useful checklist tool to make sure that you are incorporating everything you’ve learned when preparing a presentation. You can download it here, but also watch out for other resources for NGOs’ by the Goodman Centre which specialises in “helping non-profits recruit, propose, persuade, and present more effectively”.